Centipedes have one pair of legs on each segment. The legs of the first body segment contain toxins, or poisons, and are used to attack and capture prey. Centipedes have been spotted inside the Arctic Circle. The centipede can range in size from a few millimetres to 30 cm long. The centipede has been found in fossils dating over 400 million years old. All centipedes have very poor eyesight and track their prey through the use of touch. Centipedes can live as long as six years. 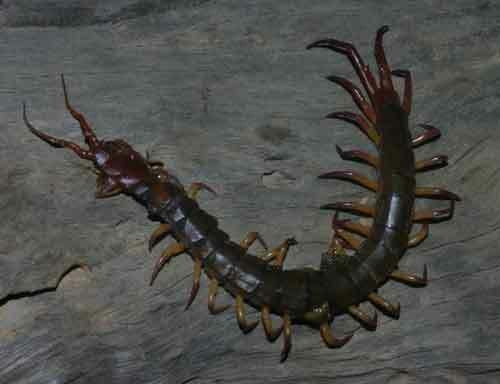 In some cultures, centipedes are used for treatment of malaria. Centipedes do not copulate. The males deposits a spermatophore for the female to take up. The Amazonian giant centipede is the largest existing species of centipede in the world, reaching over 30 cm (12 in) in length. If a centipede loses a leg it can grow another to replace it.